it was really nice to do some leisure painting the other day, just for the pure fun of it. i did some paint experiments, tried out different techniques, textures, styles, but somehow stuck with the same size canvas. they're only 8x8 which i think makes them ideal for trying things out. and then, after i'm done, sometimes i just end up painting over experimental paintings like these. i hope you'll also find a few moments to pick up a fun and creative project this week! There beautiful Simona. You really have been blessed with a great talent. These are just beautiful. You inspire me! 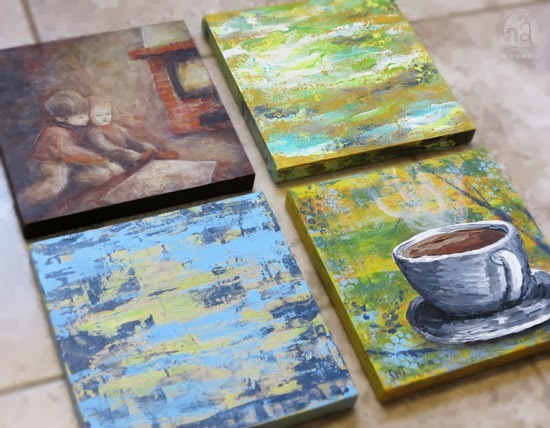 I like the small canvases and the beautiful green and blue colours.